As an American stationed in Germany you are conveniently located to visit different countries. Just west of Kaiserslautern lies the charming city of Metz, France. A short drive away you can get a glimpse into another culture, experience authentic French cuisine, be amazed by antique buildings, discover contemporary art, shop at one of the many French designer boutiques, catch a musical or play at one of the oldest opera theaters in Europe and more. 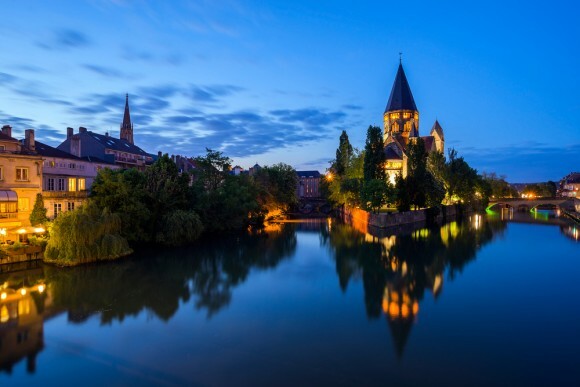 Metz is situated near the tripoint along the borders of France, Germany and Luxembourg and on the banks of the Moselle and the Seille Rivers. This friendly city is a cultural, commercial and transportation center of Lorraine and it is one of eight cities in which the French government has targets for special planning and development. Metz dates back 3000 years and has many Roman ruins including an aqueduct, thermal baths and part of an amphitheater as well as many things preserved from the medieval period. Metz has been submitted on the France’s UNESCO World Heritage Tentative List due to its historical, cultural and architectural background. The Saint-Etienne Cathédral (Saint-Stephen Cathedral of Metz) is a magnificent Gothic cathedral that was built between 1220 and 1552. It is the most visited religious structure in Lorraine and the most luminous cathedral of France. Nicknamed God’s lantern, Saint-Etienne has the largest expanse (70,000 sq feet) of stained glass windows in the world. The windows are the works from master Gothic and Renaissance glass makers of the 13th to the 20th centuries. 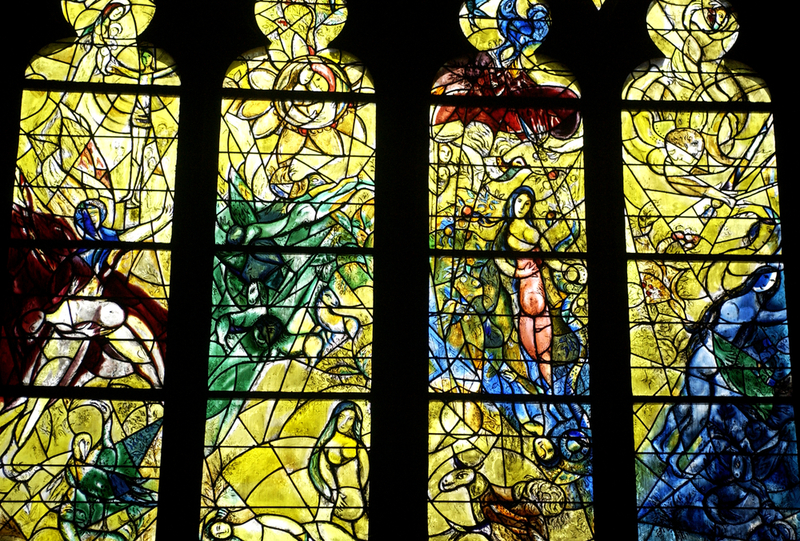 Three of the windows were made by the 20th century Russian Jewish painter Marc Chagall. Additionally, on exhibit at the cathedral is the collection of the Bishopric of Metz collection, artifacts of the Holy Roman Empire. A branch of Pompidou arts centre of Paris, the Centre Pompidou-Metz is a modern and contemporary arts museum that was designed by the Japanese architect Shigeru Ban and opened in 2010. Inspired by the shape of a Chinese hat, the building is marveled for its unique and complex roof structure. The museum exhibits semi-permanent and temporary exhibitions from the collection of the French National Museum of Modern Art. Past works that were exhibited at the museum include Picasso, Miro and Calder. Live performances, films and talks also makeup the temporary exhibition. Additionally, at the museum are ongoing art workshops for kids and teens. 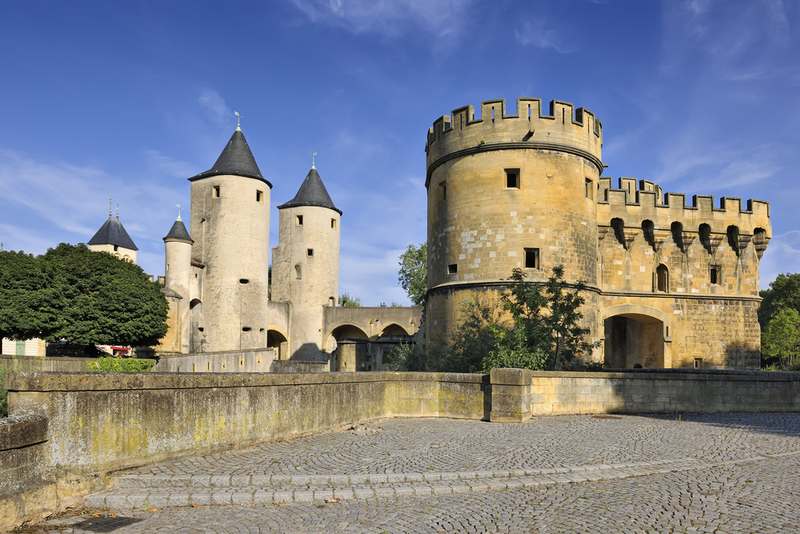 The Porte des Allemands (the Gate of the Germans) is a small, fortified castle which served both as a double door and a bridge over the river Seille. The castle gets its name from brothers Notre Dame des Allemands, who founded hospitals nearby. It was built around 1230 and has been a place of dispute for centuries between the French and German control. Opéra-Théatre de Metz Métropole (Opera House) is one the oldest opera house in Europe. The 18th century theater (with 750 seating) features plays, dance and lyric poetry. Though the theater is quite grandeur and elegant, there is no strict dress code. 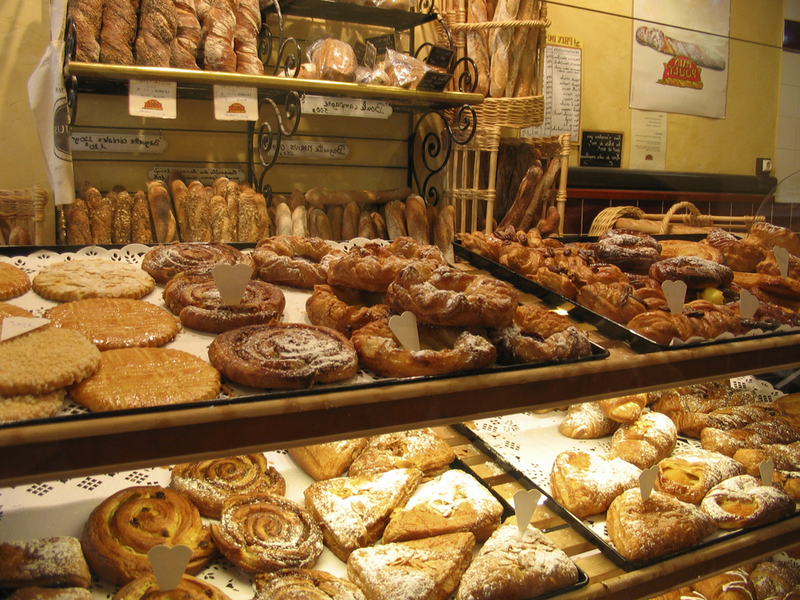 France is known around the world for its exquisite food and “to die for” pastries. The Covered Market (a large covered structure) should not to be missed when in Metz. At the historic market are permanent stalls and shops with local food producers and retailers. The building intended to be the palace for a bishop when construction began in 1785. However that plan was interrupted by the French Revolution, in which it became the Covered Market in 1833. Adjacent to the Covered Market is the Chamber’s Square (Place de la Chambre), a place where numerous of great restaurants and wine bars are located. A few of the Metz local dishes are quiche, potée (a soup or stew), the Lorraine pâté (a mixture of cooked ground meat), and suckling pig (a piglet fed on its mother’s milk). Local pastries include Metz balls, the Metz cheese pie and a ganache-stuffed biscuit covered with marzipan, caramel and dark chocolate. The regional wine is the Moselle wine, which is seldom seen in the export market. Metz hosts the second most popular Christmas Market in France during the months of November and December. Other events that bring visitors to the city are the popular Mirabelle Festival with open markets, live music, art exhibits, parades, fireworks and more; a literature festival; Montgolfiades hot air balloon festival and more. Metz is just under two hours west of Kaiserslautern, over two and a half hours southwest of Wiesbaden, and three hours west of Stuttgart. Click on DB Bahn to find out train information. This beautiful city will charm you with its culture, cuisine, history, art, shopping and so much more. 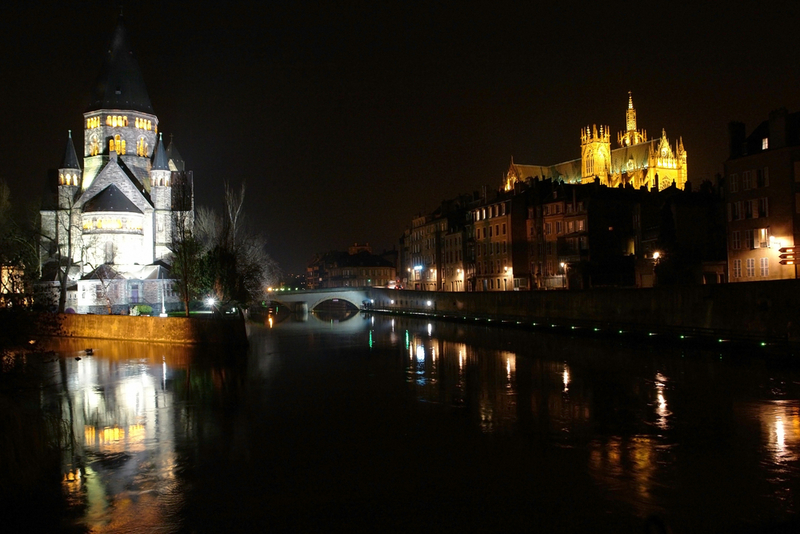 Take advantage of your time abroad and proximity and discover the French city of Metz.